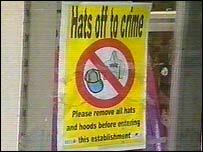 People wearing hats or hooded tops have been banned from going into shops in Folkestone as part of a crime crackdown. Many shop owners in the town centre have enforced the ban to try and stop people stealing from their stores. They have the backing of Kent Police which has said many shoplifters wear different types of head gear so they cannot be identified on CCTV cameras. Shop owner Lorraine Bartlett said: "I am trying to stop shoplifting before it even begins. "I have had a problem with shop lifting - so has Folkestone town itself. "People coming in with hoodies and hats into my shop will be asked to leave. "I would rather that than let them commit a crime and have an exclusion order slapped on them." Pc John Weller, from Kent Police, said: "Going back some years I was always told that removing your hat or head gear before entering a building was just common courtesy and manners . "I think we should be moving back towards those times." The police have said they are not just targeting young people as the ban applies to everyone.